Through the windows of time much can be seen: peace is possible, love can be above all, hate is intense, hate can decimate all hope. We see windows of harmony, civil strife, meaningfulness, warring, redemption, barbarities. Our mind’s eye translates what our eyes see and what our ears hear but for many, much is lost in translation. The muddle-minded and reasonable-minded swirl alongside in the same cesspool, at times our hands reaching out for each other’s. In calmer moments, we can hate one another, a once outstretched hand clenched into a fist. Racism rolls in the deep, tearing us apart and some of us drown. But who told of us racism? That we are different? That despite being of one ‘colour’ that instead we are distinguishable by colour? Of colour made many. In the suicide prevention work I do, in my research, in the stories, in responding to hundreds of suicide-affected families each year, I see only people, sameness. I see in each person, in each suicide-affected family every other person, every other family. Yet there is a madness in humanity in which we are told we are different – ethnically, culturally, with our values and faiths. Yes, of course, nation-building exploits these attributions. We are pitted against each other. Who benefits? Every suicide-affected family I have sat with, no matter the cultural content and sensitivities that have poured from their hearts, all have cried the same, spoken the same. In our history there has been slavery, indenture, and all forms of barbarous and inhumane exploitations. We have seen power at all costs and greed as the bedrock of the cesspool. We have sunk so low that elites with extraordinary power but trapped in disordered thinking with ruined minds carry on with wilful destruction. We now imagine difference as a starting point and the subsequent theorisations of critical race theories and of polycultural, multicultural and monocultural societies. We should start at the origin, not at the bastardisation of humanity where there has been a tearing apart of what was once one, of that which we are born into. We have been corralled into battles, into race theories and identity politics instead of our sameness despite how we wish to play out and live our lives. We are denied freedom. Identity is a liability because it has become so big in our minds, bigger than nature intended, and diversity excludes instead of including; monstrous battles. The distinguishing of people as if there are multiple identities gives way to the manifest of stigmatisation and the advent of discrimination, of dangerous falsehoods. Racism is a tool, indeed a weapon, to exploit people. No nation that peddles a dominant culture is free from the ugliest forms of racism. Cultures that peddle themselves as above others have lost sight of what humanity is. Culture is demographical and categorical but it is not defining of our humanity. Inherently every culture should be defined by our humanity and this freedom guaranteed; our mortal coil is a brief experience, of only so many days on this earth and none of these days guaranteed. The social justice and human rights journey is a struggle: arduous and regularly defeated, but the journey continues though it becomes longer and the horizon elusive. The worst enemy is disordered thinking: for too many the mind’s eye loses truth in its translations. Who are we? Where are we from? Where do we go to? The abyss of racism is deep, it is haunting, scary, and only those who have been in the abyss can articulate the terror. For those who avoid the fall the efforts are wearying and diminishing: diabolical complexities to navigate, and veils to hide behind. Only those victimised into this abyss have felt the darkness. The brutal hits on the psychosocial self in the abyss are challenged only by the fright and terror of pitchforks at the precipices to the abyss. Racism takes lives, not just ruins lives. Our prisons are filled with victims of racism. Poverty is littered with victims of racism. Aberrant behaviour is borne of racism, anger displaced to the self and to others, by both the perpetrators and victims of racism. Racism has toxic translations. It poisons the mind, weakens the heart, and debilitates the soul. It makes for more than just nervous societies, but for colosseums of terror, of warring, of insanity. Narcissism, anarchy and chaos grow violence. Those who gave rise to this, who sowed the seeds, are those who orchestrated ill-gotten gain and built citadels and anonymity. The British colonialists were not instructed by the masses, but by elites. The British were the world’s biggest slum builders; dividing peoples, fracturing peoples, delivering narratives of mass poverty, promoting tales of cultural inferiority and racialised lies. Their legacies tragically thrive. The filthy deeds of the colonialists, who invaded every region, make humanity a dominion, denying people the freedom they are born into. The historical remains contemporary: racism is institutionalised and is still as omnipresent a weapon as ever. It is has been said that no lie lives forever but we see this is not so; lies live as if forever in the windows of time. As with the litanies of lies told in the presumed heyday of the European colonialists and in the centuries of human slavery that there is a striving for equality and the alleviation of poverty, so too these lies continue today. Each lie, in each generation, is bolstered by more lies. Despite billions of people harpooned into the direst poverty and stresses by colonialism and ‘post’-colonialism, we are told that hundreds of millions of people are being lifted out of poverty, into the working and middle classes. These lies will cascade uninterrupted into generations unborn. There is more poverty today than ever before, there are more life stressors today than ever before, more people dying in wars than any before and in intertwined in all this is racism, which continues to be played out. More people suicide today than ever before in human history. Racism is not just an individual act, it is not just prejudice. Tragically it is insidious, pernicious, it is evil. Racism is a complex maze of institutions and structures of whom only a few see the blueprint. The perpetrators continue to use racism, to play out a burden of ‘civilising’ black, brown and yellow, they play out all these colours and associate inferiority, dangers. It happens that ‘whites’ dominate the structures that exploit the tale of racism – but those who are prepared to assimilate to the obscene tale of a greed so destructive it has humanity in peril, who degenerate to disordered thinking join in the presumption of spoils. There is no racism among the rulers of the world. That is where racism is seen for what it is: nothing more than a weapon, for racism is not a truth but a lie. Racism is just that, a weapon that whips in hate, hoodwinking the classes. Only at the top of the pile does it not matter whether one is black, brown, yellow, white; that’s the only bit that can be argued today that has changed – because indeed it’s never really been about colour. We are one colour made many. Racism provides this lesson, that one can betray fellow sufferers and suffer less, and that a few can get to the table. You do not have to be white to betray your sisters and brothers. Despite racism’s lie, racism is sold wholesale to the masses. 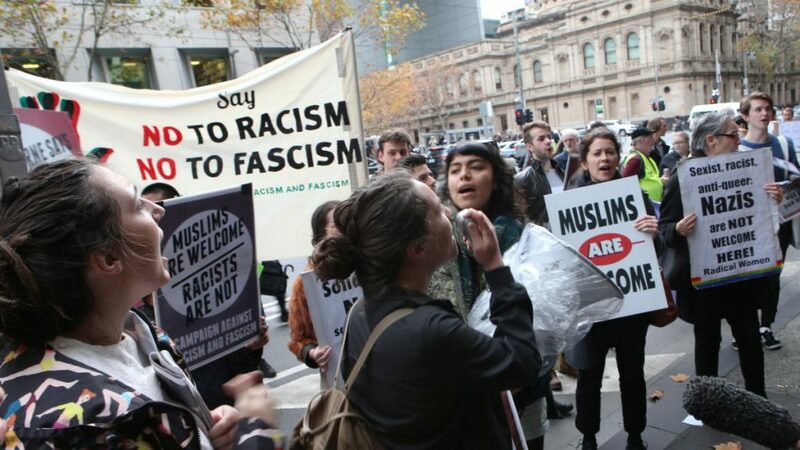 Racism has the masses fighting with each other – with politicians referring to brown asylum seekers as cockroaches; a reference to those who risk their lives in Mediterranean crossings. Cockroaches! Cockroaches? Racism has made the devil of the Arab, fuelled a crusade against Islam, but established a covenant with whiteness, the West and Judeo-Christian values. In the racism wars it matters little to humankind that children wash up dead on beaches between Turkey and Greece in the bid for asylum. White immigrants are ex-pats and black, brown and yellow immigrants are both migrants and a threat. This plays out as refugee camps, immigration detention facilities polluting landscapes, and jails are disproportionately filled with black, brown and yellow. We need to hit the streets and radicalise the conversations, smashing the narrow corridors of discourse which pollute our parliaments and deceive us because lies have proved to live as if forever. Racism is a lie that continues to live. * Gerry Georgatos is a suicide prevention and prison reform researcher and advocate with the non-tertiary Institute of Social Justice and Human Rights. He is a member of national projects to further develop suicide prevention, and well-being and education programs in prisons. Gerry’s research has a focus on trauma recovery and restorative approaches. He is also a prolific writer on the understanding of racism and on the ways forward from racism.